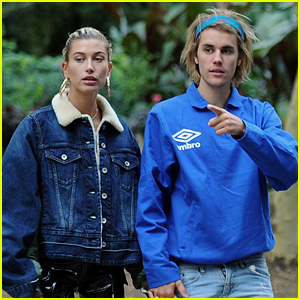 Justin Bieber & Hailey Baldwin Couple Up For Afternoon Milkshakes | Hailey Baldwin, Justin Bieber | Just Jared Jr.
Justin Bieber and Hailey Baldwin are back in the Big Apple after a quick trip to Canada. The engaged couple was seen while making stop at Shake Shack on Monday afternoon (August 13) in New York City. Justin and Hailey walked hand-in-hand as they grabbed some shakes and made an additional stop at Dunkin Donuts. Over the weekend, the duo took a short trip to Justin‘s hometown of Stratford in Ontario, Canada. The cute couple looked so happy as they grabbed coffees and enjoyed a day in the small town. Also pictured inside: Hailey braving the rain earlier in the day for a session at the gym. FYI: Justin is wearing daniel patrick shorts.